Is a lack of confidence stopping you from achieving your goals or fulfilling your dreams? I used to have very low self esteem and lacked confidence. It caused me to hide and affected me negatively in every part of my life. That all changed when I realised that it was largely caused by my own thoughts about myself. Once I clearly saw that, I was able to change these thoughts which started the healing process and my journey towards more confidence. That increased confidence changed everything for me and allowed me to achieve the results I desired. Eventually this resulted in the creation of 40+Style and the 40+Style Club. I'm now feeling happy about myself, the way I look and am doing the work I love while frequently traveling the world! The good news is that I can teach you how to get this confidence too! Start tapping into your full potental so you can achieve your wildest dreams. This month in the style club learn how to get more confidence from the inside out! In May, you are going to discover how to get the confidence to achieve anything that you set your mind to. Your goal could be to become the most stylish dresser but it can also be another goal, like being happy with your body or start that project you always dreamed of. Through exercizes and an easy to implement 5 step plan, you will learn to coach yourself and change some of the beliefs that don't serve you. Be coached by me, Sylvia, in extra bonus coach sessions this month as I teach you the tools to achieve anything you want. How do our monthly trainings & challenges work? 1. Once you join you get instant access to all current premium training and will be given a link to join the facebook group (optional). 3. You will find a short video, a workbook and full written training and images on the month's topic. Put everything that you learn to the test and get expert feedback on a daily basis in our private community! 5. Join the live online meetups. Join the special live meetups that include coaching so you can truly understand the 5 step system towards more confidence. 6. Check out our complete library of training and videos on style, color, grooming, creating capsules and so much more! Get access to all our premium training! 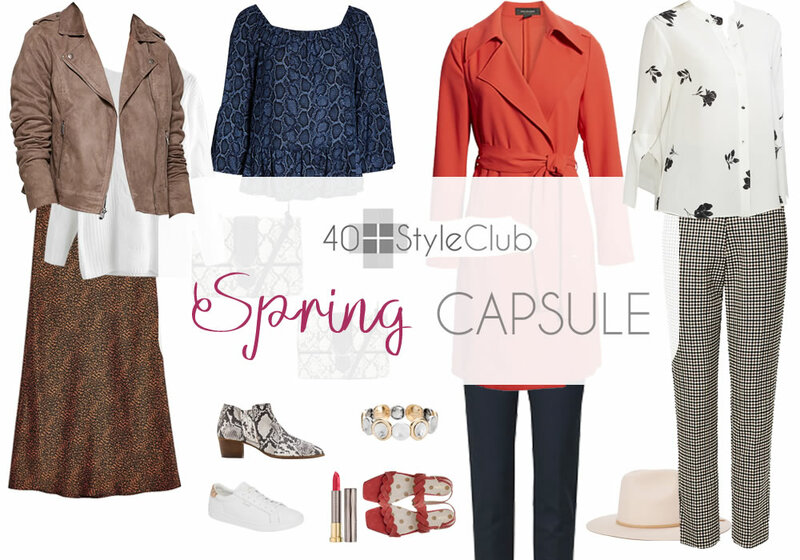 The 40+Style Club offers you much more than just the monthly training. It's a stylish online club especially for women over 40 where we teach you how to look and feel amazing every single day. Here is what you will get access to when you become a member. You will have access to our seasonal capsule wardrobes (4x per year) which will get you ready for the next season. Dive deeper into one aspect of style and advance your knowledge. Watch the videos and do the exercizes. Take part in the (optional) challenges and advance your style each month. Members LOVE the feedback from our color expert and stylist Ruth Essex as she provides details explanations for why an outfit works or doesn't work in your private member-only Facebook group. Each month we will host a live online session where you can ask questions and discuss the month's training with 40+Style founder Sylvia and your new friends. This month there will be additional special coaching sessions where you can get coached on your particular dreams or challenges. Last but certainly not least (as this is a favorite feature for many members), get to interact with likeminded women from all over the world. Join style challenges and help eachother with your styling choices. This is an intimate community where we get to know eachother really well! Sylvia van de Logt is the founder of 40plusstyle.com, the 40+Style Club and creator of the 21 Steps to a More Stylish You course. Her site & style courses have alrready helped thousands of women over 40 ignite their style. She will be your guide in finding your own true style and live your life with confidence and joy. 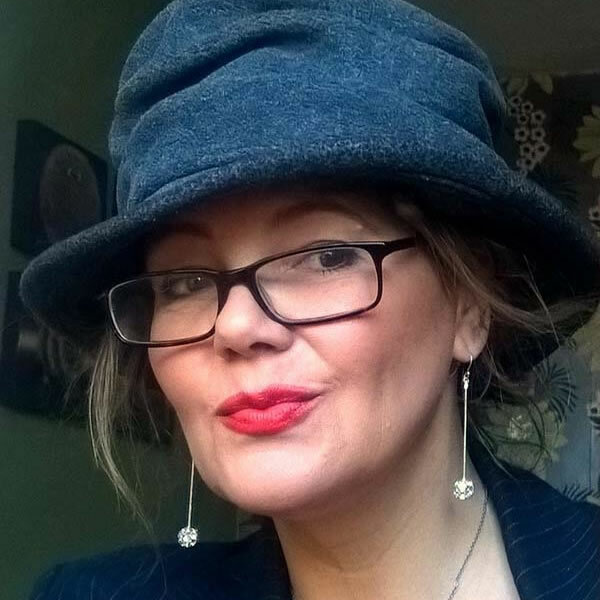 Ruth Essex is our expert stylist and color consultant who will be your go-to person for style advice in the community. She will help you define your best colors and gives detailed feedback on why particular looks work or don't work, always bearing your own personal style, personality and body shape in mind. We make it easy for you to create interesting outfits with our monthly capsules. Make new friends in your private group and see how other 40+ women style the same capsule outfits. Learn through our style masterclasses and practice what you learned in your private community. Learn how to dress your body and create a balanced and flattering silhouette. Learn how to mix & match with ease and discover your own unique style. Build a SMART wardrobe with fewer pieces (and fewer trips to the shops) that will always give you something to wear. "Happiness is the joy you feel moving towards your potential"
"The community is like having multiple personal stylists on speed dial"
What kind of women will be in the style club? I'm 60 already, is that too old? Absolutely not! Style has no age limit. There are women of all ages in the course and Style Club ranging from 40 - 70. The 60+ group will be well represented too! I'm not very technical. Is the style club easy to use? Yes! I've kept the site super simple and easy to navigate. All you need to do is login and just browse like a normal website. The community group is on Facebook (optional) which makes it very easy to interact and upload images. Do I have to be on Facebook? It depends. All the course content, challenges and resources are available on the site. Any live workshops will be recorded and made available on the site as well. However, if you wish to participate in the community (which many members find very valuable), get feedback from our style mentors and members, upload your outfits or take inspiration from the outfits of others, you will need a Facebook account. In what currency is the price? What happens after I paid? You will get a welcome email with your access info to the site. You will get immediate access to the month's training and ALL other style training and videos in the style club. If you can’t find the email, please check your Junk, spam or promotion folder in your email programme. If you still can't find, send a note for support at support@40plusstyle.com. You will remain access to everything in the club for as long as you stay a member. Can I only participate for one month? If you're not happy with the capsule and all the style training and support, you can request a full refund within 7 days of purchase. Hiring an expert stylist would cost you at least US$400 per session which will usually last only a few hours. The stylists in the style club will give you expert style advice for a whole month for much less, which is so much more effective as evolving your style takes time. It's a small price to pay for getting more style, body and self-confidence that will last you for a lifetime. Not to mention the amount of money you will save from not buying the wrong clothes and gaining more confidence. Are you ready to feel confident and happy? and live your life to your full potential? Then we would love to help you! 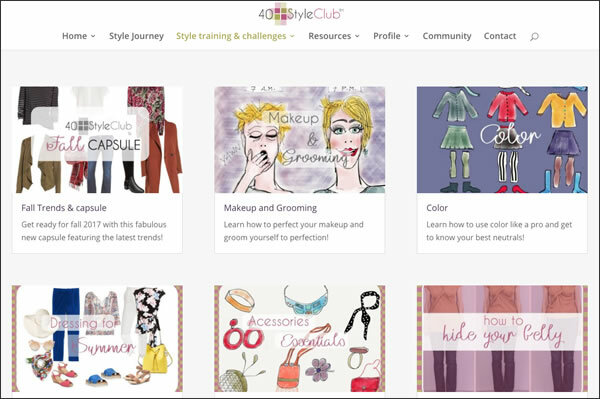 Enroll in the 40+Style Club today and get instant access to all premium training!